Isn't he cute? 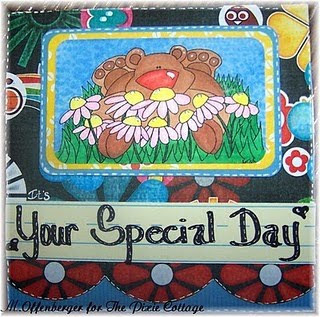 This is a digi stamp Waking Up To Spring by one of my new favorite artists-ArTish-I love her name. Her designs can be found at The Pixie Cottage. If you haven't found their blog hop over and take a browse around. They've got neat challenges and lots of other talented artists designing for them. You can find lots of different styles of stamps, so I'm sure you will find something that suits your fancy. The neat thing about hopping over this week is Michelle is very generously offering some blog candy with easy instructions to follow to get your name in the hat. Don't delay, she will be drawing 3 winners on April 15th, they will each get their favorite stamp. This one is my favorite and you all know, I love to win.